The Wetaskiwin Theatre Society and the Waterworks Players continue to step up their game with their latest offering, 'Diamond Studs, The Life of Jesse James'. The large cast and live musical section performed over the last two weekends in the greatly improved Manluk Theatre which has undergone extensive structural and stage modifications over the last year. A larger performance area, theatre seating, a renovated green room, new lighting and sound booth, and better access are just a few of the improvements to the facility which have greatly increased the usability and capability of the theatre. The production was an ambitious undertaking involving both rookie actors and singers alongside of seasoned stage performers. Though a few showed the occasional nervousness, perhaps stepping into new territory for the first time, the majority of the show was well presented and thoroughly entertaining. Though many gave standout performances, special mention has to be given to the lead, Ryan Lindsay, who truly brought the legend of Jesse James to life. The story of Jesse James was told with acting, song, dance and a dose of humour. Through it all, the almost capacity audience was drawn into the life of the western anti-hero, from the defeat of the Confederate Army, the banding together of the James and Younger boys, the almost legendary status attributed Jesse for robbing the Union North banks and trains, and finally, the cowardly killing of Jesse by the fame seeker Bob Ford. 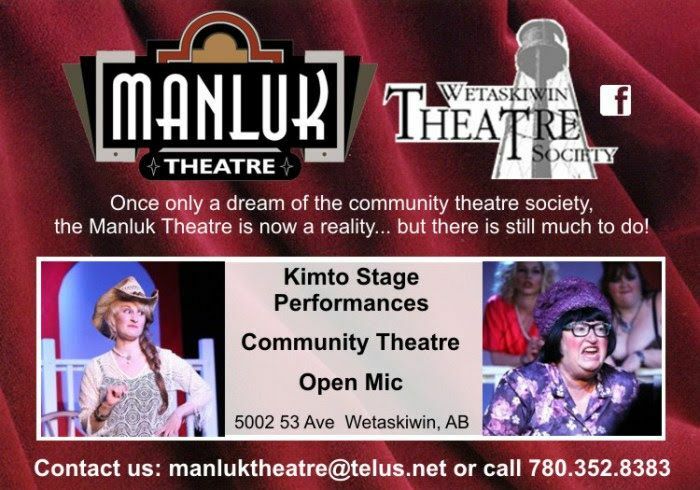 We look forward to the continued growth of the performing arts in Wetaskiwin through the significant contributions of facilities like the Manluk Theatre, their army of volunteers, the many gifted actors, singers and musicians who love the arts, and the support of the public and local business.